If you have a solid content marketing asset to publish, you’d better use lots of great tools to promote your piece as well as to monitor those helping you promote it. If you archive all the tweets sharing your content, you’ll be able to identify your most powerful (and successful) promoters: These are your first targets to reach out to further build the relationship and turn them into your brand ambassadors. 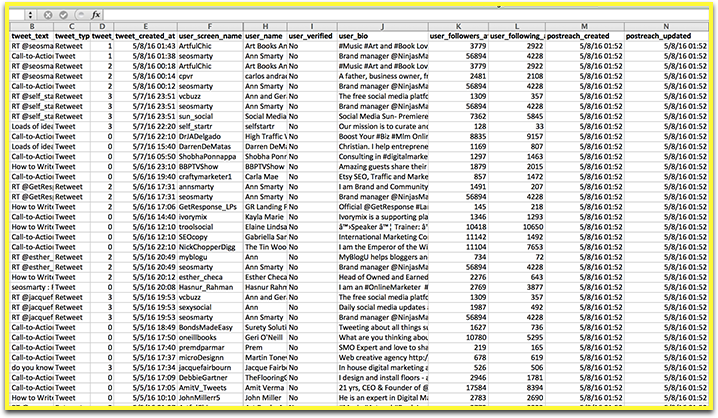 Thanks to their advanced searching, sorting and filtering capabilities, spreadsheets (Excel and Google Spreadsheets) make the most sense for creating that Twitter archive. The best part is that it will fetch and export tweets and retweets allowing you an easy Excel export. Twitter Archiver is a Google Sheets Addon that lets you export and archive Twitter search results in a Google Spreadsheet (which you can easily export into an Excel file). 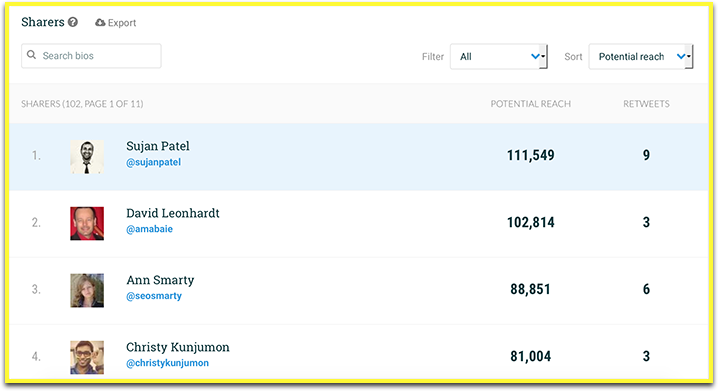 Spreadsheets let you search, sort, and share your data with your team. Now, just copy-paste the URL you want to track or your site domain and let it run:. The addon will search and archive 100 tweets. It will then search Twitter every hour for new tweets. If you are a Zapier user, you can create a more customizable spreadsheet using a Zapier app. It may also be a better option for those who are careful about authenticating Twitter with too many apps, so if you are already using Zapier, you will feel safer using it. 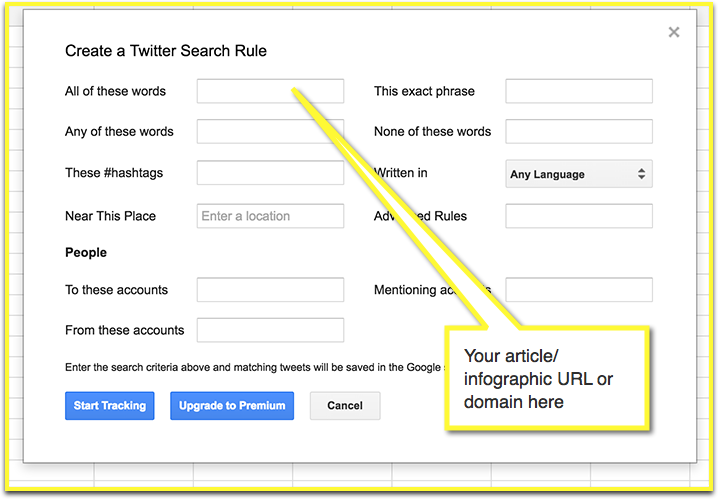 Not only can you save the tweet URL, body, date and time, but also the author’s name, handle, follower count, location and more. First, you’ll need to set the search parameters (in our case, that would be your Article URL) and then connect this Twitter search to a Google Spreadsheet. 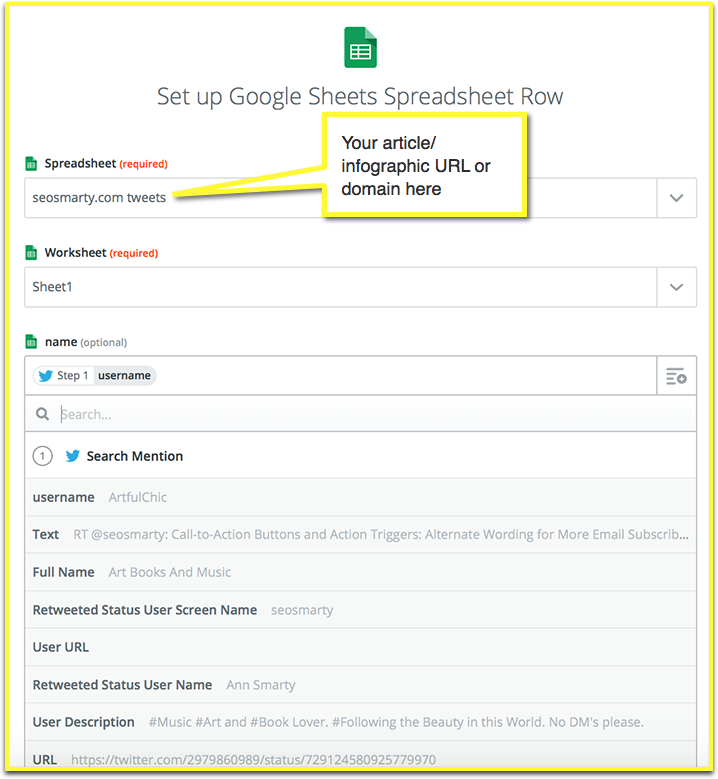 To use Google spreadsheets on Zapier, follow these steps. The columns: As many as you choose to include. Zapier can fetch pretty much anything from Twitter API. You can use plenty of columns. If you are into local business, for example, you can archive the location of each Twitter user who tweeted your URL! Good luck playing with your spreadsheets! Excellent article. This is great stuff for someone like me who’s still fairly wet behind the ears as a twitter user. This is such a great idea, Ann! Thanks! Glad to know you liked it, Joyce!